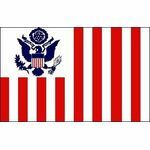 The United States Customs and Border Protection Ensign has 16 vertical red and white stripes, and a white canton displays the U. S. coat of arms in blue. 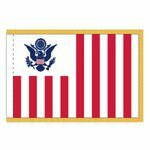 The U.S. Coast Guard places a badge in the fly of this flag. 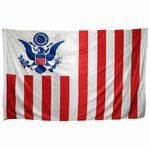 It is flown at every American customs house on land and at port of entries between the U.S. and Canada or Mexico.